Amazingly, I slept like a baby and woke up with the sunrise Sunday. I felt pretty good despite bruises on both of my knees (from my handlebars), my neck being stiff as ever, and my forearms burning. I utilized some Tiger Balm and ate a strong breakfast, I was going to make sure I stayed powered up all day this time. I brought a bag with a load of snacks and anything I could use throughout the day. Our Sunday morning shenanigans entailed the 8-ball race. If you haven’t heard of this race, it’s one of the most savage, human induced injury, races, ever. In a group of 5 people, there is a race down a class 2 course with other humans wearing 8 ball jerseys. Their (the 8-ball’s) main goal is to stop all of the racers from getting to the finish line, using all the means they can without grabbing them and making them swim. I’m always apprehensive during this race but I have never won it, or even been on the podium more than twice. Truthfully, I usually leave GoPro early enough to not race on Sundays. Anyways, I soared through the 8-ball race to make it into the finals in the afternoon. I went straight to the start of my next race, Pepi’s face-off. 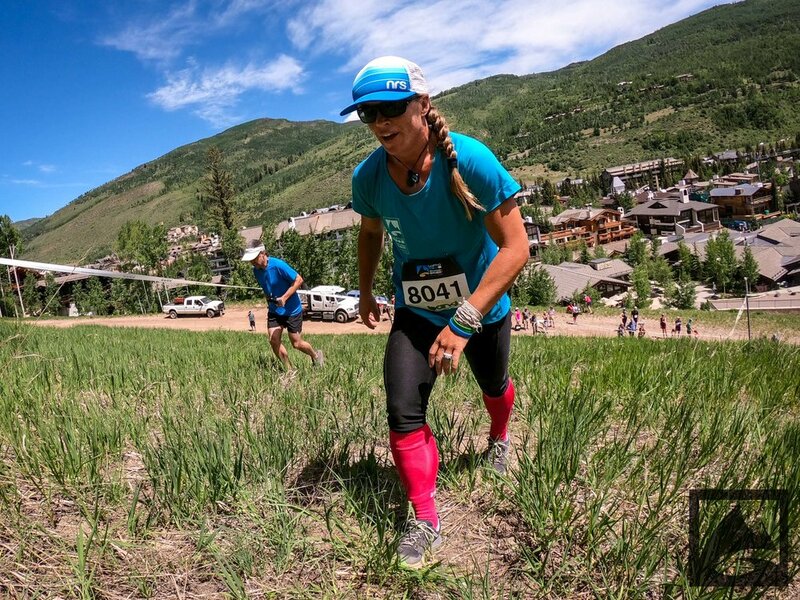 This event is a running race up one of the steeper faces of the Vail mountain. The point is to run up and back down it as many times as possible in 30 minutes. After an alarm goes off at 30 minutes, the racers all run back to the start as fast as they can. Mid-race, I was literally crawling on all fours up the mountain side and jogging back down the hill. My legs were burning but all I could think about was the race being 30 minutes long and the pain would go away after the race ended. I did four laps on Pepi’s face and was stoked on ending the race with my neck feeling much better. After eating some lunch, I headed out to the climbing wall to do a citizens climbing event. We were given problems that went from non-challenging at a 1 all the way to the harder problems that were around the 40’s. I have never done a climbing event but I figured I would at least be able to do like 4 problems. I finished one. One whole problem. I had to almost run to make it to the 8-Ball final after being pretty broken during climbing. My forearms were burning and I could barely hold my paddle. This was my final event of the Ultimate Mountain Challenge and I knew I pretty much had it in the bag, despite not really knowing what the other points were of the other women I was competing against. It didn’t matter if I won this race, I had won the UMC, most likely. I was the last one off of the starting line, everyone was in front of me. I passed the local girl from Colorado and then passed Courtney when she was pushed onto a rock in the middle of the river. I was top three with Nouria and Emily battling it out in front of me. I suddenly looked up and saw the whole field of 8-ballers heading to river left and literally pinning the other two girls to the shore, leaving a magic carpet wide open in front of me. I had one person between me and finally winning the 8-Ball race… Ken Hoeve. Well known for hard hits and taking peoples teeth out. As I came through the freestyle feature I did a quick switch in momentum and juked Hoeve to get under the International Bridge first. Hammering the final nail in the coffin of my UMC victory. Because so many points went into the UMC for the whole field it took some time to compile the total points. I knew I had won while I was packing all of my stuff up and getting ready to leave Vail and head to the next event in Idaho. On Monday I had to drive from Glenwood Springs, CO to McCall Idaho. That is when I finally got the call that I had actually won the event. The whole weekend was insanely tiring and my body was kind of mad at me. But, I felt so strong and accomplished. Truthfully, I can’t wait for the event next year and I hope more people take part in it as the years come.